After you get a pet time to check sugar glider accessories. This pets do bring joy and a sense of fulfillment to their owners. Some pet owners derive joy and pleasure in taking care of customary pets such as dogs and cats. But there are other individuals who enjoy more exotic and unique animals such as spiders and snakes. Nowadays, even the wild sugar glider is slowly becoming a favorite pet for exotic animal lovers. Because these animals are exotic and are naturally wild, proper knowledge of their origin and the necessary accessories will ensure better health and quality of life for the animals. This pets are gliding possums that are native to Australia and neighboring countries. These animals have squirrel-like bodies with long tails and thick fur coats. Their furs are usually grey or sometimes albino. When needed, they can glide due to their patagium, a membrane that extends from the fifth finger to the first toe. This pets are nocturnal, they tend to sleep in the day and hunt at night. Usually, they are residing in the hollow trees and are found in groups of up to ten. In the wilderness, they feed on insects and small vertebrates. Their diet also consists of trees with sweet saps such as eucalyptus and gum trees. As was previously mentioned, this pets are mostly left in the wild, but some people care for them as pets. Their absence in the wild will cost them a number of problems so it is important to replicate all parts of their activities when a person decides to take them as pets. It is therefore necessary that when taking care of this pets, keepers should purchase these accessories. These accessories range food and vitamins, cages, treats and toys. 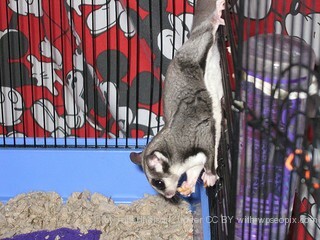 The first thing an owner should take into consideration when buying sugar glider accessories is the cage. The cage should allow adequate space for the animal to move about. Some of the materials that are considered safe for use as cage includes Pine, Balsa, Birch, Basswood, Poplar, Maple and Walnut. Owners should stay away from cages that are made from Cedar, Red Cherry and Ply woods as they are deemed unsafe for these animals. Food and diet also play an important role as owners should provide a balanced diet for their animals. There are numerous foods available for this pets including fruit mixes, food worms and powdered sweets that can be diluted in water to resemble nectars. Of course, it is of prime importance to keep the beloved pets busy and active; sugar glider accessories in the form of tunnels, bridges jungle cage plants, or branches should also be placed in their cage. Lastly, keeping the cage clean is also an issue, so cleaning agents should also be purchased. With proper knowledge of the animal’s nature and needs, owners will not only be pleased with their pets, they also ensure great life for these cute and furry animals. Most of the accessories and needs of these creatures are available in sites that are devoted to caring and maintaining these extraordinary creatures.